When we are young, visual stimuli in the outer world — faces, objects, scenes — seem slow. But as we age, so do they seem to raise their speed. How does our brain make us perceive the world as too fast or too slow depending on our age? This question motivated the present study. 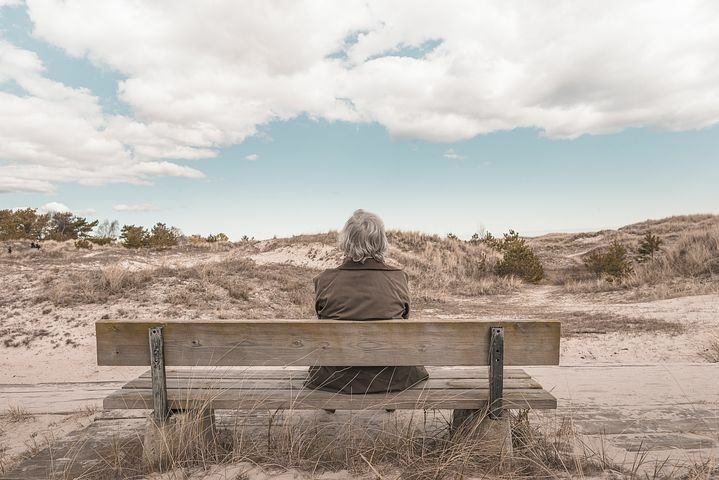 Both scientific and anecdotal evidence indicates that older people tend to perceive stimuli as too fast because their processing of visual information is slowed compared to that of younger people. As cognitive neuroscience researchers, we are interested in understanding how this happens in the brain. We first establish the speed of visual processing of people of different ages. We do so by using experimental psychology paradigms that allow assessing visual attention in a well-controlled manner. For this study, 91 healthy volunteers (ages 20 to 77) performed a ‘whole-report’ visual attention task. Participants saw an array of four letters briefly presented (for less than the duration of an eye blink) on a computer screen. After each array’s presentation, they should orally report all letters they had seen. The ‘whole-report’ paradigm we used is based on the theory of visual attention (or ‘TVA’) proposed by the Danish Professor Claus Bundesen in 1990. Controlling for factors related to the speed of visual processing that also differs among younger, middle-aged, and older people was crucial for this study. These factors included motor speed, memory, and the time needed to be able to see a stimulus. The TVA-based whole-report task permitted us to control them. Participants additionally underwent 12 minutes of functional magnetic resonance imaging while during rest (‘resting-state fMRI’). These data allowed us to calculate ‘functional connectivity.’ Functional connectivity is the term used to define the temporal correlation of the activity among particular brain regions. It also represents a view of the brain as functioning in networks that support behavior and cognition. Previous research has pointed at one brain network as particularly relevant for the speed of visual processing: the ‘cingulo-opercular network’ — whose name refers to the two central regions it involves: the anterior cingulate cortex, which lies in the medial side of the frontal cortex, and the anterior insula, which lies behind the frontal operculum (or opening). Thus we focused on this network. 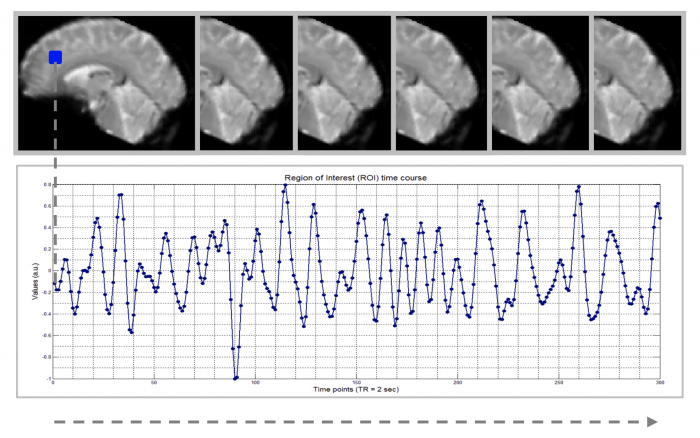 Using TVA’s proposed mathematical equations, we estimated each participant’s speed of visual processing in ‘number of letters per second.’ Then we obtained each participant’s individual version of the cingulo-opercular network. We determined the effect of older age on both. Figure courtesy Adriana L. Ruiz Rizzo. We replicated results from previous studies: older age was associated with both slowed visual processing and reduced functional connectivity in the cingulo-opercular network. More interestingly, beyond previous studies, we found that the degree of slowing in the visual processing was associated with the degree of functional connectivity in the cingulo-opercular network. In particular, the functional connectivity in one region of this network, the left insula, significantly correlated with the individual estimates of the speed of visual processing. The found association between the speed of visual processing and functional connectivity in the cingulo-opercular network was not observed when other age-relevant networks, visual attention functions, or health risk factors were examined instead. These control analyses indicate that age-related differences in the functional connectivity in the cingulo-opercular network, specifically, can contribute to the age-related differences that are observed in the speed of visual processing. 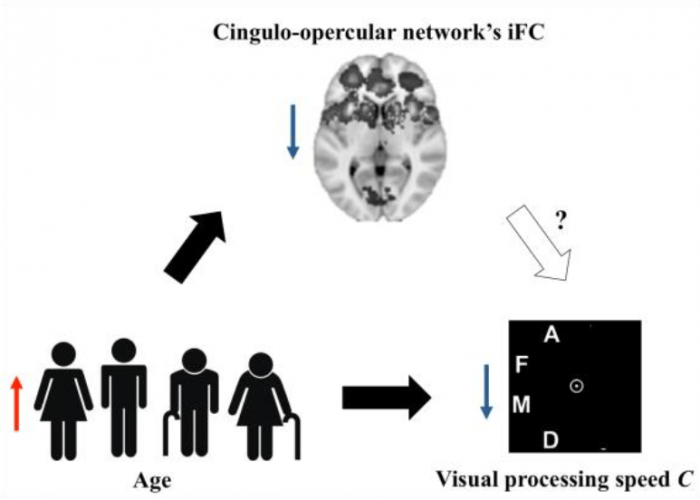 The functional connectivity in the cingulo-opercular network additionally mediated the effect of age on the speed of visual processing. This finding suggests that the slowed visual processing observed in advanced ages might be given because aging would affect the functional connectivity in the cingulo-opercular network and then the functional connectivity in the cingulo-opercular network would influence the speed of visual processing. Longitudinal studies, however, should corroborate this suggestion. Our findings thus propose a model for studying changes in the speed of visual processing where the functional connectivity in the cingulo-opercular network plays a prominent role. We believe this model will open new avenues for the intervention studies that target the improvement of attention in older age. So perceiving the world as too fast or too slow does not appear to depend solely on our age — a network anchored in frontal regions connects to help us catch up with it. These findings are described in the article entitled Decreased cingulo-opercular network functional connectivity mediates the impact of aging on visual processing speed, recently published in the journal Neurobiology of Aging (Neurobiology of Aging 73 (2019) 50-60). This work was conducted by Adriana L. Ruiz-Rizzo, Natan Napiórkowski, Julia Neitzel, Aurore Menegaux, and Hermann J. Müller from the Ludwig-Maximilans-Universität München, Christian Sorg from the Ludwig-Maximilans-Universität München and the Technische Universität München, Signe Vangkilde from the University of Copenhagen, and Kathrin Finke from the Ludwig-Maximilans-Universität München and Jena University Hospital. Previous Post« Previous Endocan: Can It Predict Post-Operative Pneumonia?